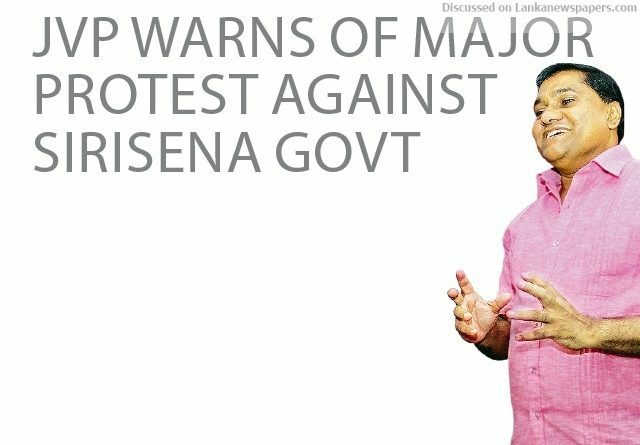 The Janatha Vimukthi Peramuna (JVP) yesterday (4) warned that if the Parliament is not reconvened by 16 November, they will take to the streets, with all other civil societies, groups and unions, against President Maithripala Sirisena’s unconstitutional and illegal government. Addressing the Media, at the JVP Head Office in Colombo, JVP Propaganda Secretary MP Vijitha Herath said, “this unlawful Government has prorogued the Parliament and is falsely claiming that the Parliament will be summoned on 5 or 7 November. He said that the way this fake Government is down-playing the summoning of Parliament, it looks like they won’t convene it on 16 November also. “Therefore, as the representative of the people, we will take action. We will come together with all civil associations and other unions and will fight for the democracy,” Herath further said. He added that their party does not support any political Party or any politician such as Mahinda Rajapaksa or Ranil Wickremesinghe. He claimed that public has seen their true colours and the JVP is always in public’s mind. “This battle is not to bring anyone to the power, but to reinstate democracy. Parliament is the place where Parliamentarians can take decisions on behalf of the people. And that’s why we are insisting on reconvening the Parliament. Not to grant power to anyone,” he said. Herath said that according to the 20th Amendment, the President can dissolve and prorogue the Parliament, as well as summon it. He said that in the past, all other politicians benefitted from this loophole in the Constitution. “And that’s why we ask to amend this Constitution, because we predicted that someday someone is going to use this loophole in a very bad way and currently we all experience it” he stated. Herath claimed that when previous Government decided to amend the Constitution, the JVP had urged them to remove the arbitrary power of the President. “And now the country is experiencing the effect of this live” he stated. Commenting on the recent crossovers, Herath noted that in this power gamble, all the ministers are being bought over for Rs 40-50 billions. He said that to stop crossovers, JVP came up with a statement in 19th Amendment. “Adding that statement and when it was produced to the Parliament MPs Dinesh Gunawardena and Wijeyadasa Rajapakshe disagreed and suddenly that statement was removed from the amendment, ” he said. Parliamentarian Sunil Handunnetti said that the sudden decrease in the prices of some fuel and some goods are temporary and this is a trick to stop the people objecting and to change their attention from the unconstitutional Government. “We remind the public that this is just like candy where you will taste the sweetness very soon and then it will vanish and nothing will remain for your benefit” he further added. ← President advances reconvening of Parliament to 14 Nov.